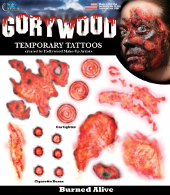 This set of 16 temporary tattoos includes a variety of shapes and sized burn effects guaranteed to make you look perfectly horrific. Tattoo sheet is 18cm x 15cm, average burn piece size 5-6cm across. Transfers use FDA approved inks,use with black face paint to complete the look of fresh burn trauma with these tattoos. Freddy Kruegar has never been so easy to perfect! Simply blend the edges with some black and red face paint to bring everyone's least favourite nightmare to life.